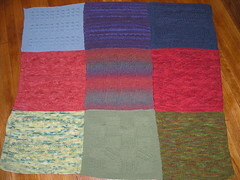 Minky Knits: At last, a finished object! The baby blanket for my coworker used up 17 skeins of sock yarn. Woohoo! The gender is unknown so I had to find colors that worked for both genders. This was a good stashbusting and mindless knitting experience. For once, I remembered to take a picture before giving it away (see Arleta?!). I just need to weave the ends in and wash it.